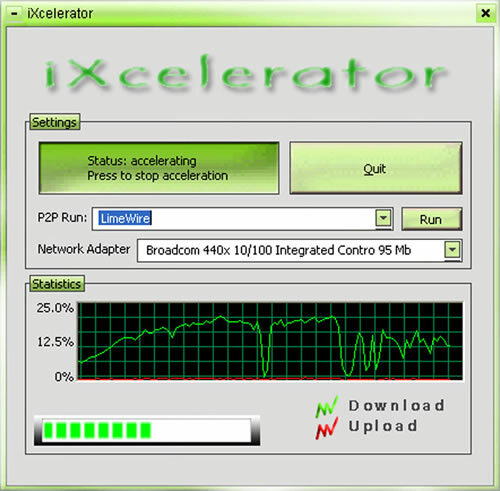 iXcelerator is an accessible universal acceleration plug-in with internet connection optimizing features that works with all BitTorrent p2p clients. The first convenient characteristic of iXcelerator is its versatility - iXcelerator was designed to work perfectly with all file sharing applications including uTorrent, Limewire, Shareaza, Bearshare, Vuze, eMule, Bittorrent, BitComet, Frostwire etc. iXcelerator is easy-of-use. Run it and let it run. iXcelerator is easy-of-use - Run it and let it run! Qweas is providing links to iXcelerator 1.7.0 as a courtesy, and makes no representations regarding iXcelerator or any other applications or any information related thereto. Any questions, complaints or claims regarding this application iXcelerator 1.7.0 must be directed to the appropriate software vendor. You may click the publisher link of iXcelerator on the top of this page to get more details about the vendor.